The Freeze-Frame Revolution by Peter Watts is a very highly recommended, dark, hard science fiction novel. "Sixty-six million years, by the old calendar. That’s how long we’ve been on the road." The construction ship Eriophora was built inside an asteroid and is controlled by AI called the Chimp. The crew of the Eriophora, referred to as spores, were all raised specifically to spend their lives building wormhole gates throughout space to make interstellar travel more accessible. They spend most of their time in suspended animation and are awake one day in a million. At the onset of their mission they all believed in it completely. Sunday Ahzmundin has a friend, Lian, who is beginning to question their purpose and her role in it. Sunday is also looking for a missing crew member. The problem is that no one is awake for long, the members of the teams awake changes, and the Chimp, who is looking out for what is best for you, sees through your eyes and hears through your ears. Then Sunday begins to uncover secrets and pieces together plans for a mutiny that has been cleverly hidden from the Chimp. This is an exceptional hard science fiction story that is part of a larger collection, The Sunflower cycle, which currently consists of The Island, Hotshot, Giants, and The Freeze-Frame Revolution. (You can go to Watt's Website to read them.) The Freeze-Frame Revolution reminded me of 2001: A Space Odyssey in some ways, especially with the all-knowing and seeing AI, but this isn't a direct comparison by any means. Watts demonstrates that he is an outstanding science fiction author who can create psychologically complex characters and place them in equally unique complicated environment and set it all in a compelling narrative. 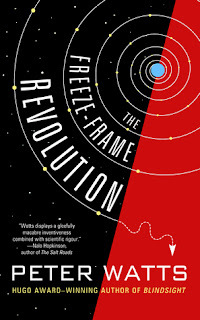 While it is classified as a novella, The Freeze-Frame Revolution packs the punch of a well written, tightly constructed novel. Disclosure: My review copy was courtesy of Tachyon Publications.